Many artists who are representational painters have a yearning to try working abstractly, but are hesitant, and don’t know how to begin. When confronted with the Great Whiteness (a blank canvas), it can be difficult to visualize the finished painting when there is no scene, vase, animal, flower, etc. there to paint from. This workshop is ideal for artists wishing to pursue abstract painting with purposeful exploration of a variety of abstract styles. We will study the work of abstract artist masters, and find ways to adapt their work to our own style, with an emphasis on mixed media. Each day, students will create one or more painting that illustrate a style, particular technique, or use of materials outside the realm of traditional art supplies. 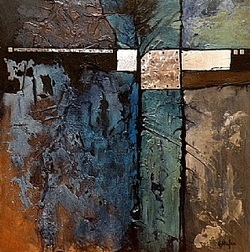 Carol is a mixed media painter and certified Golden Artist Educator. Carol recently completed the course work required by Golden Artist Colors, Inc., to be certified in “all things acrylic.” Carol will guide you in using and creating your own collage materials, including altered papers, embossed aluminum foil, faux rusted metal, Tyvek, epoxy resin, and several Golden mediums. These items will be provided by Carol. Carol will discuss and demonstrate the importance of composition and color in your work. She will explain the use of various acrylic mediums, types of adhesives, types of supports, and methods of presentation for a finished piece. Carol’s teaching style is relaxed, humorous, and she generously shares her techniques and tips on how to create mixed media abstract fine art. Acrylic paints – Carol uses Golden Fluid and High Flow Acrylics. Artist’s Loft Watercolor Pad – 140 lb- 24 sheets, 9x12 inches (available at Michael's) You will use several sheets per day. 8x8 and 6x6 inch cradled wood panels – about two each. Carol likes BAROQUE ARTIST PANELS by Masters of Fine Arts. We will mount our best results on the panel(s). If you’re wildly successful, you may need several of these. Pages from old books, maps, puzzles, old “unsuccessful” watercolor paintings and collage ephemera you want to bring. Carol will bring a large supply of specialty papers. Stencils and stamps you may have. Carol will bring several to try. Carol will bring a variety of Golden Mediums, Custom Patch, YES glue, and collage items for your use.